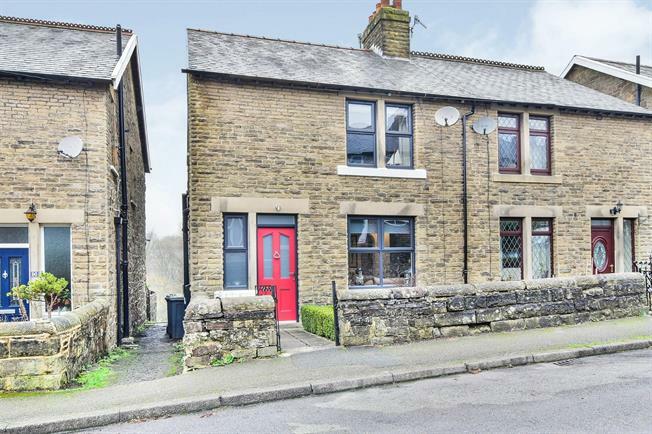 2 Bedroom Semi Detached House For Sale in Buxton for Asking Price £220,000. If you're looking to kick off 2019 in style then look no further than this stunning period semi-detached property. From the vibrant entrance door the positive first impression lasts throughout with the impressive open plan living accommodation on the ground floor, two large bedrooms, high quality kitchen and bathroom fittings and the incredibly useful basement to the spacious gardens and garage there is much to admire and enjoy in this fantastic property. In brief the accommodation includes an entrance hall, an open plan living, dining and kitchen space and a garden room with cloaks/wc to the ground floor, a lobby opening to a laundry room and home gymnasium to the lower ground floor and two large double bedrooms and a bathroom to the first floor. Prospective buyers may notice that the large master bedroom was previously two separate bedrooms and this layout could be easily reinstated if so desired. Other features include gas central heating, uPVC double glazing throughout, thoughtfully landscaped rear gardens including a vegetable garden and a spacious timber garden house and the separate garage which is just a short walk from the property itself. Viewing is highly recommended in order to fully appreciate everything that this fabulous property has to offer. Acoya entrance door with chrome plated brass fittings (25 year guarantee), a double glazed uPVC window with frosted glass facing the front, a double radiator, stairs to the first floor landing, access to lower ground floor area and a door to the open plan living/dining room. Double glazed double doors hung on projection hinges opening to the garden room, two radiators and open plan aspects to both the living room and kitchen. Comprising wall and base units, roll top work surfaces including a stainless steel one and a half bowl sink with mixer tap, drainer and splashbacks, an integrated electric double oven, an integrated gas hob with over hob extractor, space for a fridge/freezer and a double glazed uPVC window facing the rear. Comprising a close coupled WC and a wall-mounted wash hand basin with tiled splashback and recessed downlights. Double glazed uPVC window with frosted glass facing the side, a recently fitted wall mounted Worcester Bosch condenser boiler, space for a washing machine, a dryer, a fridge and a freezer. Double glazed uPVC window facing the rear, double radiators and a feature fireplace. Comprising a three piece Ideal Standard suite with Cifial basin taps and shower fittings and also including a panelled bath with mixer tap and thermostatic shower attachment, a pedestal wash hand basin and a close coupled WC. Double glazed uPVC window with frosted glass facing the side, a heated towel rail, a heated mirror, underfloor heating and part tiled walls.